Michigan is located in the upper Midwest and the heart of the Great Lakes region of the United States. During the winter, heavy snowfall is commonplace. There are several great places to ski or snowboard. Other attractions include the antique markets, shops and shows that bring crowds from around the Great Lakes area. Featured destinations include Traverse City (popular for its many festivals and beaches), Mackinac Island, Mackinaw City, Ann Arbor (home of the University of Michigan), Detroit (the Motor city) and the Sleeping Bear dunes National Lakeshore. Michigan is also the historic base of the U.S. auto industry. The Henry Ford museum and village is Michigan’s number one cultural attraction. In the autumn, “Michigan Fall Color Tours" are popular. To travel around the state, you will need to rent a car, book a bus or train ticket. If you choose to explore Michigan by car, be aware of local road conditions, especially during winter. For more information visit: michigan.org. Fort Mackinac. Photo by Robert Stokstad. The Arab American National Museum in Dearborn tells the story of Arab American culture and history through exhibits, artwork, artifacts, photographs, film and special events. Fort Mackinac is a former military compound that now recreates 19th century history with exhibits, historical reenactments and more. 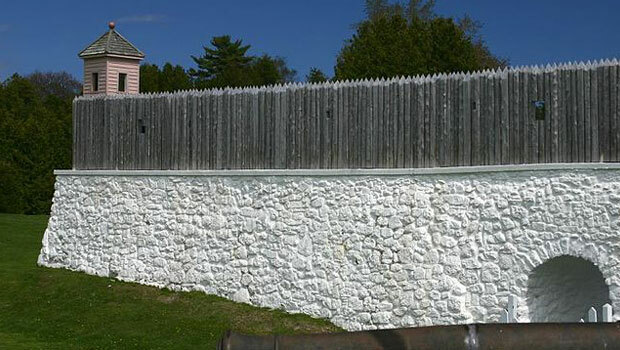 Buying a ticket to the fort also allows visitors to see other nearby sites in Historic Downtown Mackinac. The Grand Rapids Public Museum is a Michigan history museum with exhibits on topics like Native American culture in Michigan, the history of Grand Rapids and immigrants that have moved to the area. The Great Lakes Shipwreck Museum exhibits artifacts from shipwrecks in Whitefish Bay. The museum is located at Whitefish Point on Lake Superior and is open from May to October. The Detroit Historical Museum recounts the history of Detroit from the 18th century to today, including an exhibit that recreates the streets of Old Detroit and exhibits on Detroit’s history as the “Motor City”. The Henry Ford Museum houses a collection of objects ranging from pop culture items to antique machinery to aircraft and automobiles. An IMAX theater shows many types of films and new exhibits come to the museum on a regular basis. Visit the Motown Historical Museum to learn about the rich musical history of Detroit and the Motown record label. Visitors will see Motown exhibits, artifacts and memorabilia and learn about the social and cultural changes associated with Motown music in Detroit. The Charles H. Wright Museum of African American History teaches visitors about the culture and history of African Americans with exhibitions, artifacts and special events. Browse a list of Michigan tours or search by city on the official Michigan tourism website. Sleeping Bear Dunes. Photo via National Park Service. Bordered by four of the five Great Lakes, Michigan provides many recreational opportunities for international visitors, such as swimming, boating, fishing, kayaking, canoeing, scuba diving and much more. In Ann Arbor, the Matthaei Botanical Gardens & Nichols Arboretum at the University of Michigan allows visitors to learn about nature and see beautiful gardens, exhibits, hiking trails and a conservatory. Ludington State Park is a popular area for canoeing and activities like camping, hiking, skiing, biking and swimming at the park’s beaches along 6 miles of shoreline. 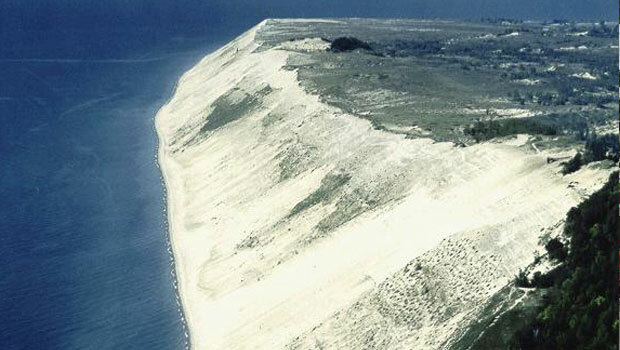 Sleeping Bear Dunes National Lakeshore along Lake Michigan has outdoor activities for all seasons, including snowshoeing, cross-country skiing, snowmobiling, hiking, kayaking, swimming, fishing and biking. Michigan has 51 ski areas for skiing and snowboarding in many areas of the state. Beginners can take lessons and try out the ‘bunny hills’ while more experienced skiers and boarders will enjoy the difficult trails. Some resorts also offer other winter outdoor activities like snowshoeing, cross-country skiing and ice skating. Michigan is known for several types of food and has a diverse agricultural industry. Northern Michigan is known for its cherries, and the state is a leading producer of peaches, blueberries, apples, grapes and peaches. In Detroit, specialty foods include its own Coney Island hot dog, Faygo pop and Detroit-style pizza. The Michigan Farmers Market Association provides information on local farmers’ markets throughout Michigan. 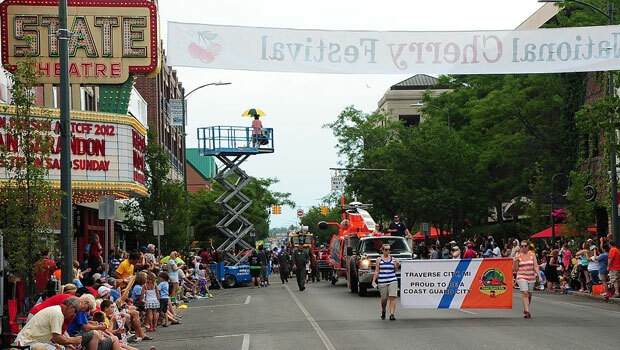 Cherry Festival in Traverse City. Photo by Levi Read. Celebrate winter at the Plymouth Ice Festival with events like ice sculptures, ice skating, snowboarding, skiing, live music and food. Held in January, the festival also has a “hot spot warming tent” to keep visitors warm! The Tulip Time Festival in Holland, MI celebrates the city’s Dutch heritage with parades, traditional dancing and music, food, attractions, music, live theater and much more each May. The East Lansing Art Festival is a fine arts festival that allows hundreds of artists and artisans to present their original artwork and craft in an outdoor exhibition and marketplace. Live music, food and other events are also held over the two-day festival in May. The Detroit Windsor International Film Festival in June presents films from student filmmakers along with professional Hollywood movies. Feature films, shorts, documentaries, music videos and animation are some of the categories included in the festival. The Detroit Jazz Festival is held over Labor Day weekend in September in downtown Detroit with over 100 performances located on five stages. The festival also presents educational programs, workshops, children’s events and fireworks. Held in late November, America’s Thanksgiving Parade in Detroit dates back to 1924 and is a popular holiday event in Michigan. Marching bands, floats and balloons travel through the streets of downtown Detroit to mark the beginning of the Christmas season. The Detroit Department of Transportation (DDOT) operates buses in the city of Detroit and connects with the regional SMART Bus system. SMART Bus is a regional bus system in Southeast Michigan, including the Detroit metro area. The Detroit People Mover is a light rail system operating in the central business district in downtown Detroit. Capital Area Transportation Authority operates bus services in Lansing, including Michigan State University. For other local public transit systems, visit the American Public Transportation Association website for a complete list of public transportation options in Michigan. Greyhound provides comprehensive bus services in Detroit, Michigan and throughout the United States. Indian Trails provides scheduled bus routes between various Michigan cities and Chicago, IL. Megabus travels from Detroit, East Lansing, Grand Rapids and Ann Arbor to several locations across the United States, including Chicago, New York and Cleveland. Michigan Flyer buses travel between Ann Arbor, Detroit Metro Airport and East Lansing. Amtrak travels between Detroit, Grand Rapids, East Lansing, Pontiac and Chicago on the Wolverine route. One Brick Detroit offers short-term and one-time volunteering opportunities and aims to make volunteering a fun, social and flexible activity for young people and adults. Volunteer with the Greening of Detroit to help build green spaces and urban gardens throughout the Detroit region. Individuals and groups welcome. Find a local affiliate to help build affordable housing with Habitat for Humanity Michigan. Volunteers are needed for many types of tasks, often with no experience required! Find a local volunteer opportunity with Volunteer Centers of Michigan. VCM helps connect volunteers with organizations in all areas of Michigan. Volunteer at a local food bank in Michigan by visiting Feeding America. Individuals and groups are often needed to perform tasks like sorting donations, stocking shelves and working in community kitchens.